AMMAN (Jordan), November 15 (RIA Novosti) – The Russian Orthodox Church will encourage pilgrims to travel to Israel, the Palestinian territories and Jordan to thereby widen its presence in the region, Patriarch Kirill of Moscow and All Russia said at the end of his five-day visit there. Some of the events on his visit agenda were “aimed at increasing the presence of the Russian Orthodox Church in the Holy Land,” Patriarch Kirill said on Wednesday while summing up the visit. “First of all, we want as many of our pilgrims as possible to visit the Holy Land,” he said. 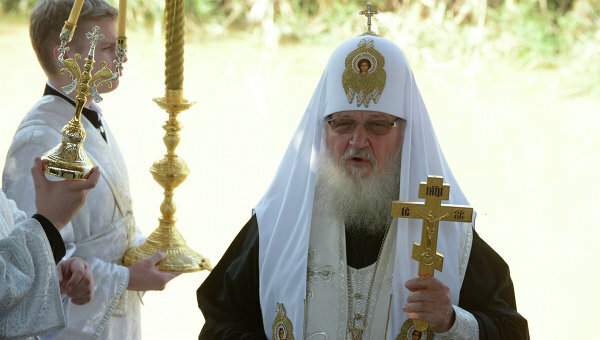 During his stay, the Patriarch consecrated a Russian church – the Church of All Russian Saints – in a Jerusalem suburb, visited the Russian Pilgrims House at the place where Jesus Christ is believed to have been baptized, and paid visits to other Christian holy sites in the Holy Land. The foundations for the Church of All Russian Saints in the Gornensky Convent were laid in 1911, but construction was suspended 1914 and only resumed in 2003. The Gornensky Convent is situated in the Jerusalem suburb of Ein Karem, where, according to Christian tradition, John the Baptist was born. The head of the Russian Orthodox Church also met with Israeli President Shimon Peres, Palestinian leader Mahmoud Abbas and Jordanian King Abdullah II. During talks with them, the Russian Patriarch called for a peaceful solution to all current Middle East problems. Russian Orthodox Church spokesman Deacon Alexander Volkov said on Wednesday that the conflict over unpaid water bills of the Church of the Holy Sepulchre in Jerusalem was resolved with the help of the Russian Orthodox Church after Patriarch Kirill met with Israeli President Peres. The Church of the Holy Sepulchre, which has for centuries been one of the most important pilgrimage destinations for millions of Christians as the purported site of the crucifixion and resurrection of Jesus Christ, earlier in November threatened to close its doors as its bank account was frozen over a debt to an Israeli water company. The church had been exempt from water charges in a tacit agreement with Jerusalem authorities for decades but the Hagihon company, which took over water supply to Jerusalem in the late 1990s, recently demanded payment of a $2.3 million bill dating back 15 years, including interest. Volkov said the Israeli authorities have written off the Holy Sepulchre Church’s water debt for the past seven years. Regarding the remaining water bills for previous years, a special commission will look into the issue, he said. From 2013, the church will have to pay water bills, but on favorable terms.